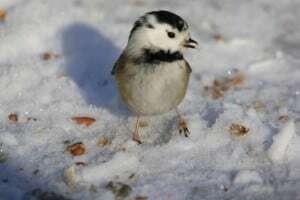 I’ve had a “white-capped chickadee” visiting my feeders on Langton Street for the last three years. Its tail and wings are those of a normal chickadee but everything else is pure white. I was amazed when I first saw this bird, so looked it up on Google and found it’s not all that rare. Interesting though that it’s been coming for 3 years (that I know of). Note: Leucism refers to abnormal pigmentation.